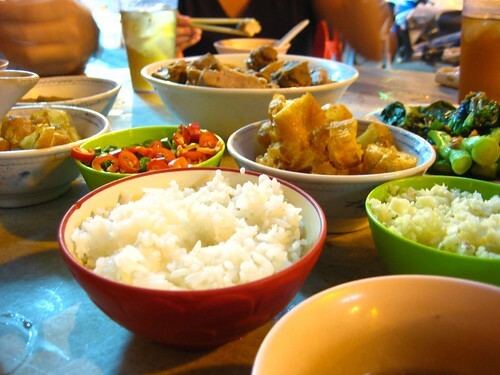 Bak Kut Teh, which literally means Meat Bone Tea (in “Hokkien” dialect) is a Chinese Soup but which is most common and popular at foodstalls in Malaysia and Singapore where it has found a honouring and hungry foodie crowd that allowed the settling and development of this specialty. The main part of the dish is a very dark and intense pork broth which is flavoured with a multitude of herbs such as star anise, cinnamon, cloves, dang gui (some kind of ginseng accountable for a slight bitter note in the soup) and fennel seeds and is also darkened with soy sauce. When I first tried this very rich herbs and meat broth I suspected it to contain MSG due to the nearly unreal intensity it effuses. But after several meditative sips I could taste out all the herbal nuances and got convinced by the purity of the ingredients. The Bak Kut Teh broth is served plain in a bowl. It was separetely accompanied by chunks of pork that were cooked in the broth for hours until tender, white rice, Chinese greens, chunks of fried dough called You Tiao, as well as minced garlic and chilies that you can mix into the broth. 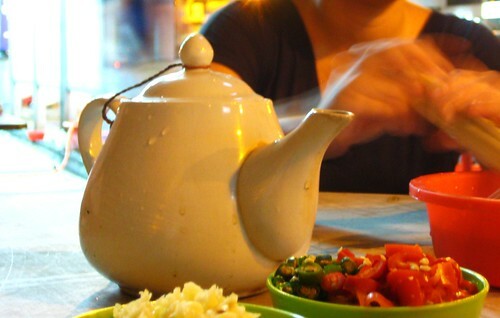 Other versions of Bak Kut Teh are served with different toppings including tofu skin or “tau pok”, straw mushrooms, shitake mushrooms or even pig’s intestines. And most times the broth is topped with coriander leaves before serving. 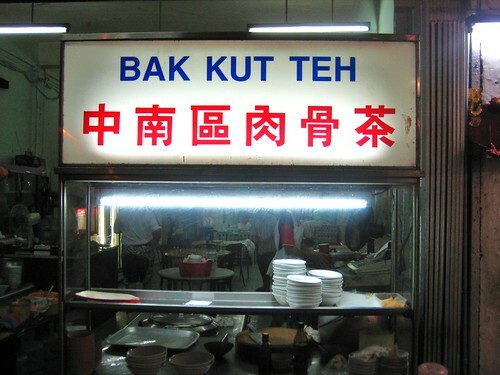 I have to admit that I never heard of Bak Kut Teh until that day when my brother urged me to try it out. But now that I had it once, I would recommend every traveller interested in Asian food to have a taste of it. The shop we went to is supposedly one of the better. It is called Khong Lock Yuen and is located a bit remotedly from the city center on Jalan Raja Laut opposite City Hotel – so it should be in the 360’s house numbers. It is also featured on this map. 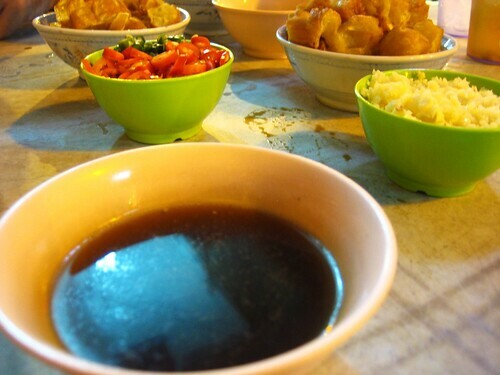 However, if you want to explore this dish more thoroughly, the best Bak Kut Teh shops can be found outside Kuala Lumpur in a suburb called Klang. Also, the herbs for the soup are also sold in ready made packs in Chinese shops and for export. Just rice with soup, i can ate 2 bowls, yummy!